Yummm, are you hungry yet? I can not wait to make the toffee this year. James’ grandma used to make English Toffee every Christmas. She would make tons of it. We would always save cookie tins for her because we knew that she would give out as much toffee as she had tins to put them in. All of her family would look forward to getting her toffee at Christmas. James loved her toffee and guarded it like a prized possession. When she died I knew that I needed to learn how to make toffee so he could still have it each Christmas. I worried that it would be hard to make but it is actually a lot easier than I thought it would be. The main concern is to be careful not to burn yourself. Boiling sugar will stick to your skin and make for a nasty burn. The other problem is how to keep people from eating it all. English Toffee makes for a great small handmade gift over the holidays. It is perfect for when you need to bring something along to someone’s house. 1. Prepare a 12×16 inch cookie sheet by lining it with aluminum foil and spraying it with nonstick cooking spray. 2. Combine the butter, sugar, water and corn syrup in a large heavy saucepan over medium heat. Stir constantly to dissolve the sugar and melt the butter. Insert a candy thermometer and bring the candy to a boil, periodically brushing down the sides with a wet pastry brush to prevent crystallization. 3. Continue to cook the candy, stirring gently, until it reaches 300 degrees. If the candy appears to separate (with a layer of melted butter on top) stir vigorously to make it come back together again. Watch the candy as it approaches 300, since it cooks quickly and can scorch at high temperatures. 4. Once the candy reaches 300 degrees, remove from heat and pour it onto the prepared baking sheet. Use a spatula or spoon to spread the candy to an even thickness. 5. Sprinkle chocolate chips over hot mixture and place a baking sheet over pan so the heat will melt the chocolate chips. After about a minute or two, spread the melted chocolate chips over candy. 6. While candy is still hot, Score with a knife into squares for easier breaking when it is cooled. Chill until firm. Yummm! I think I will use this recipe to make some toffee for my family’s gifts! You got some buzz at Ohana Mama! 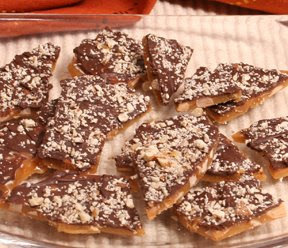 My mother made English toffee just like this every Christmas. It was always the sign that the holidays were upon us when trays of this delightful candy were found in our kitchen. that does look really good. My daughter and I are supposed to do some baking this weekend and I'm thinking this should be on our list.